The Road to Serfdom: Good Hayek or Bad Hayek? A new book by Angus Burgin about the role of F. A. Hayek and Milton Friedman and the Mont Pelerin Society (an organization of free-market economists plus some scholars in other disciplines founded by Hayek and later headed by Friedman) in resuscitating free-market capitalism as a political ideal after its nineteenth-century version had been discredited by the twin catastrophes of the Great War and the Great Depression was the subject of an interesting and in many ways insightful review by Robert Solow in the latest New Republic. Despite some unfortunate memory lapses and apologetics concerning his own errors and those of his good friend and colleague Paul Samuelson in their assessments of the of efficiency of central planning, thereby minimizing the analytical contributions of Hayek and Friedman, Solow does a good job of highlighting the complexity and nuances of Hayek’s thought — a complexity often ignored not only by Hayek’s critics but by many of his most vocal admirers — and of contrasting Hayek’s complexity and nuance with Friedman’s rhetorically and strategically compelling, but intellectually dubious, penchant for simplification. The MPS [Mont Pelerin Society] was no more influential inside the economics profession. There were no publications to be discussed. The American membership was apparently limited to economists of the Chicago School and its scattered university outposts, plus a few transplanted Europeans. “Some of my best friends” belonged. There was, of course, continuing research and debate among economists on the good and bad properties of competitive and noncompetitive markets, and the capacities and limitations of corrective regulation. But these would have gone on in the same way had the MPS not existed. It has to be remembered that academic economists were never optimistic about central planning. Even discussion about the economics of some conceivable socialism usually took the form of devising institutions and rules of behavior that would make a socialist economy function like a competitive market economy (perhaps more like one than any real-world market economy does). Maybe the main function of the MPS was to maintain the morale of the free-market fellowship. We have not here entered upon the important question of what feasible institutional reforms might be introduced to lessen the degree of disharmony between full employment and price stability. These could of course involve such wide-ranging issues as direct price and wage controls, antiunion and antitrust legislation, and a host of other measures hopefully designed to move the American Phillips’ curves downward and to the left. But actually, Solow was undoubtedly right that the main function of the MPS was morale-building! Plus networking. Nothing to be sneered at, and nothing to apologize for. The real heavy lifting was done in the 51 weeks of the year when the MPS was not in session. Anyway, enough score settling, because Solow does show a qualified, but respectful, appreciation for Hayek’s virtues as an economist, scholar, and social philosopher, suggesting that there was a Good Hayek, who struggled to reformulate a version of liberalism that transcended the inadequacies (practical and theoretical) that doomed the laissez-faire liberalism of the nineteenth century, and a Bad Hayek, who engaged in a black versus white polemical struggle with “socialists of all parties.” The trope strikes me as a bit unfair, but Hayek could sometimes be injudicious in his policy pronouncements, or in his off-the-cuff observations and remarks. Despite his natural reserve, Hayek sometimes indulged in polemical exaggeration. The appetite for rhetorical overkill was especially hard for Hayek to resist when the topic of discussion was J. M. Keynes, the object of both Hayek’s admiration and his disdain. Hayek seemingly could not help but caricature Keynes in a way calculated to make him seem both ridiculous and irresistible. Have a look. So I would not dispute that Hayek occasionally committed rhetorical excesses when wearing his policy-advocate hat. And there were some other egregious lapses on Hayek’s part like his unqualified support for General Pinochet, reflecting perhaps a Quixotic hope that somewhere there was a benevolent despot waiting to be persuaded to implement Hayek’s ideas for a new liberal political constitution in which the principle of the separation of powers would be extended to separate the law-making powers of the legislative body from the governing powers of the representative assembly. This is a common interpretation of Hayek’s thesis in the Road to Serfdom. And it is true that Hayek did intimate that piecemeal social engineering (to borrow a phrase coined by Hayek’s friend Karl Popper) created tendencies, which, if not held in check by strict adherence to liberal principles, could lead to comprehensive central planning. But that argument is a different one from the main argument of the Road to Serfdom that comprehensive central planning could be carried out effectively only by a government exercising unlimited power over individuals. And there is no empirical evidence that refutes Hayek’s main thesis. A few years ago, in perhaps his last published article, Paul Samuelson wrote a brief historical assessment of Hayek, including personal recollections of their mostly friendly interactions and of one not so pleasant exchange they had in Hayek’s old age, when Hayek wrote to Samuelson demanding that Samuelson retract the statement in his textbook (essentially the same as the one made by Solow) that the empirical evidence, showing little or no correlation between economic and political freedom, refutes the thesis of the Road to Serfdom that intervention leads to totalitarianism. Hayek complained that this charge misrepresented what he had argued in the Road to Serfdom. Observing that Hayek, with whom he had long been acquainted, never previously complained about the passage, Samuelson explained that he tried to placate Hayek with an empty promise to revise the passage, attributing Hayek’s belated objection to the irritability of old age and a bad heart. Whether Samuelson’s evasive response to Hayek was an appropriate one is left as an exercise for the reader. Defenders of Hayek expressed varying degrees of outrage at the condescending tone taken by Samuelson in his assessment of Hayek. I think that they were overreacting. Samuelson, an academic enfant terrible if there ever was one, may have treated his elders and peers with condescension, but, speaking from experience, I can testify that he treated his inferiors with the utmost courtesy. Samuelson was not dismissing Hayek, he was just being who he was. The question remains: what was Hayek trying to say in the Road to Serfdom, and in subsequent works? Well, believe it or not, he was trying to say many things, but the main thesis of the Road to Serfdom was clearly what he always said it was: comprehensive central planning is, and always will be, incompatible with individual and political liberty. Samuelson and Solow were not testing Hayek’s main thesis. None of the examples of interventionist governments that they cite, mostly European social democracies, adopted comprehensive central planning, so Hayek’s thesis was not refuted by those counterexamples. Samuelson once acknowledged “considerable validity . . . for the nonnovel part [my emphasis] of Hayek’s warning” in the Road to Serfdom: “controlled socialist societies are rarely efficient and virtually never freely democratic.” Presumably Samuelson assumed that Hayek must have been saying something more than what had previously been said by other liberal economists. After all, if Hayek were saying no more than that liberty and democracy are incompatible with comprehensive central planning, what claim to originality could Hayek have been making? None. Yep, that’s exactly right; Hayek was not making any claim to originality in the Road to Serfdom. But sometimes old truths have to be restated in a new and more persuasive form than that in which they were originally stated. That was especially the case in the early 1940s when collectivism and planning were widely viewed as the wave of the future, and even so thoroughly conservative and so eminent an economic theorist as Joseph Schumpeter could argue without embarrassment that there was no practical or theoretical reason why socialist central planning could not be implemented. And besides, the argument that every intervention leads to another one until the market system becomes paralyzed was not invented by Hayek either, having been made by Ludwig von Mises some twenty years earlier, and quite possibly by other writers before that. So even the argument that Samuelson tried to pin on Hayek was not really novel either. To be sure, Hayek’s warning that central planning would inevitably lead to totalitarianism was not the only warning he made in the Road to Serfdom, but conceptually distinct arguments should not be conflated. Hayek clearly wanted to make the argument that an unprincipled policy of economic interventions was dangerous, because interventions introduce distortions that beget further interventions, producing a cumulative process of ever-more intrusive interventions, thereby smothering market forces and eventually sapping the productive capacity of the free enterprise system. That is an argument about how it is possible to stumble into central planning without really intending to do so. Hayek clearly believed in that argument, often invoking it in tandem with, or as a supplement to, his main argument about the incompatibility of central planning with liberty and democracy. Despite the undeniable tendency for interventions to create pressure (for both political and economic reasons) to adopt additional interventions, Hayek clearly overestimated the power of that tendency, failing to understand, or at least to take sufficient account of, the countervailing political forces resisting further interventions. So although Hayek was right that no intellectual principle enables one to say “so much intervention and not a drop more,” there could still be a kind of (messy) democratic political equilibrium that effectively limits the extent to which new interventions can be piled on top of old ones. That surely was a significant gap in Hayek’s too narrow, and overly critical, view of how the democratic political process operates. THE GOOD HAYEK was not happy with the reception of The Road to Serfdom. He had not meant to provide a manifesto for the far right. Careless readers ignored his rejection of unqualified laissez-faire, and the fact that he reserved a useful, limited economic role for government. He had not actually claimed that the descent into serfdom was inevitable. There is no reason to doubt Hayek’s sincerity in this (although the Bad Hayek occasionally made other appearances). Perhaps he would be appalled at the thought of a Congress full of Tea Party Hayekians. But it was his book, after all. The fact that natural allies such as Knight and moderates such as Viner thought that he had overreached suggests that the Bad Hayek really was there in the text. But not exactly right. Hayek was not totally good. Who is? Hayek made mistakes. Let he who is without sin cast the first stone. Frank Knight didn’t like the Road to Serfdom. But as Solow, himself, observed earlier in his review, Knight was a curmudgeon, and had previously crossed swords with Hayek over arcane issues of capital theory. So any inference from Knight’s reaction to the Road to Serfdom must be taken with a large grain of salt. And one might also want to consider what Schumpeter said about Hayek in his review of the Road to Serfdom, criticizing Hayek for “politeness to a fault,” because Hayek would “hardly ever attribute to opponents anything beyond intellectual error.” Was the Bad Hayek really there in the text? Was it really “not a good book?” The verdict has to be: unproven. PS In his review, Solow expressed a wish for a full list of the original attendees at the founding meeting of the Mont Pelerin Society. Hayek included the list as a footnote to his “Opening Address to a Conference at Mont Pelerin” published in his Studies in Philosophy, Politics and Economics. There is a slightly different list of original members in Wikipedia. Walter Eucken, Freiburg i. B.
W. A. Orten, Northampton, Mass. Last week I did a post based on a chart that I saw in an article in the New York Review of Books by Paul Krugman. Relying on an earlier paper by Robert Hall on the empirical evidence about the effectiveness of fiscal stimulus, Krugman used the chart to illustrate the efficacy of government spending as a stimulus to economic recovery. While Krugman evidently thought his chart was a pretty compelling visual aid in showing that fiscal stimulus really works, I didn’t find his chart that impressive, because there were relatively few years in which changes in government spending were clearly associated with large changes in growth, and a lot of years with large changes in growth, but little or no change in government spending. In particular, the years in which government spending seemed to make a big difference were during and immediately after World War II. 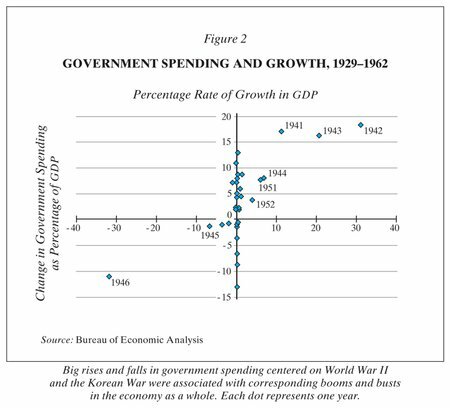 The 1930s, however, were associated with huge swings in GDP, but with comparatively minimal changes in government spending. Instead, changes in GDP in the 1930s were associated with big changes in the price level. The big increases in GDP in the early 1940s were also associated with big increases in the price level, the rapid rise in the price level slowing down only in 1943 after price controls were imposed in 1942. When controls were gradually lifted in 1946 and 1947, inflation increased sharply notwithstanding a sharp economic contraction, creating a spurious (in my view) negative correlation between (measured) inflation and the change in GDP. From 1943 to mid-1945, properly measured inflation was increasing much faster than official indices that made no adjustment for the shortages and quality degradation caused by the price controls. Similarly, the measured inflation from late 1945 through 1947, when price controls were being gradually relaxed and dismantled, overstated actual inflation, because increases in official prices were associated with the elimination of shortages and improving quality. So in my previous post, I tried to do a quantitative analysis of the data underlying Krugman’s chart. Unfortunately, I only came up with a very rough approximation of his data. Using my rough approximation (constructing a chart resembling, but clearly different from, Krugman’s), I ran a regression estimating the statistical relationship between yearly changes in military spending (Krugman’s statistical instrument for fiscal stimulus) as a percentage of GDP and yearly changes in real GDP from 1929 to 1962. I then compared that statistical relationship to the one between annual changes in the price level and annual changes in real GDP over the same time period. After controlling for the mismeasurement of inflation in 1946 and 1947, I found that changes in the rate of inflation were more closely correlated to changes in real GDP over the 1929-1962 time period than were changes in military spending and changes in real GDP. Unfortunately, I also claimed (mistakenly) that that regressing changes in real GDP on both changes in military spending and inflation (again controlling for mismeasurement of inflation in 1946-47) did not improve the statistical fit of the regression, and did not show a statistically significant coefficient for the military-spending term. That claim was based on looking at the wrong regression estimates. Sorry, I blew that one. Over the weekend, Mark Sadowski kindly explained to me how Krugman did the calculations underlying his chart, even generating the data for me, thereby allowing me to reconstruct Krugman’s chart and to redo my earlier regressions using the exact data. Here are the old and the new results. So, according to the correct data set, the relationship between changes in government spending and changes in GDP is closer than the approximated data set that I used previously. However, the newly estimated coefficient on the government spending term is almost 30% smaller than the coefficient previously estimated using the approximated data set. In other words a one dollar increase in government spending generates an increase in GDP of only 50 cents. Increasing government spending reduces private spending by about half. Here are my old and new regressions for changes in real GDP on government spending as well as on inflation (controlled for mismeasurement of inflation in 1946-47). As you can see, the statistical fit of the regression improves by including both inflation and the change in government spending as variables (the adjusted r-squared is .648) and the coefficient on the government-spending term is positive and significant (t = 2.37). When I re-estimated the regression on Krugman’s data set, the statistical fit improved, and the coefficient on the government-spending variable remained positive and statistically significant (t = 3.45), but was about a third smaller than the coefficient estimated from the approximated data set. So even if we allow for the effect of inflation on changes in output, and contrary to what I suggested in my previous post, changes in government spending were indeed positively and significantly correlated with changes in real GDP, implying that government spending may have some stimulative effect even apart from the effect of monetary policy on inflation. Moreover, insofar as government spending affects inflation, attributing price-level changes exclusively to monetary policy may underestimate the stimulative effect of government spending. However, if one wants to administer stimulus to the private sector rather than increase the size of the public sector at the expense of the private sector (the implication of a coefficient less than one on the government-spending term in the regression), there is reason to prefer monetary policy as a method of providing stimulus. The point is that the US government is running clearly excessive public deficits and the public debt has grown far too large so isn’t fiscal tightening exactly what you need? I think it and the fiscal cliff ensures that. Yes, I agree tax hikes are unfortunate from a supply side perspective, but cool down a bit – it is going to have only a marginally negative impact on long-term US growth perspective that the Bush tax cuts experiences. But more importantly the fiscal cliff would mean cuts in US defense spending. The US is spending more on military hardware than any other country in the world. It seems to me like US policy makers have not realized that the Cold War is over. You don’t need to spend 5% of GDP on bombs. In fact I believe that if the entire 4-5% fiscal consolidation was done as cuts to US defence spending the world would probably be a better place. But that is not my choice – and it is the peace loving libertarian rather than the economist speaking (here is a humorous take on the sad story of war). What I am saying is that the world is not coming to an end if the US defense budget is cut marginally. Paradoxically the US conservatives this time around are against budget consolidation. Sad, but true. I am not going to take the bait and argue with Lars about the size of the US defense budget. The only issue that I want to consider is what would happen as a result of the combination of a large cut in defense (and in other categories of) spending and an increase in taxes? It might not be catastrophic, but there seems to me to be a non-negligible risk that such an outcome would have a significant contractionary effect on aggregate demand at a time when the recovery is still anemic and requires as much stimulus as it can get. Lars argues that any contractionary effect caused by reduced government spending and increased taxes could be offset by sufficient monetary easing. I agree in theory, but in practice there are just too many uncertainties associated with how massive fiscal tightening would be received by public and private decision makers to rely on the theoretical ability of monetary policy in one direction to counteract fiscal policy in the opposite direction. This would be the case even if we knew that Bernanke and the FOMC would do the right thing. But, despite encouraging statements by Bernanke and other Fed officials since September, it seems more than a bit risky at this time and this place to just assume that the Fed will become the stimulator of last resort. So, Lars, my advice to you is: be careful what you wish for. PS Noah Smith has an excellent post about inflation today. UPDATE: See my correction of an error in the penultimate paragraph. Last week I read an article Paul Krugman published several months ago for the New York Review of Books just before his book End This Depression Now came out. The article was aimed not aimed at an audience of professional economists, and consisted of arguments that Krugman has been making regularly since the onset of the crisis just over four years ago. However, the following passage towards the end of the article caught my eye. [S]ince the crisis began there has been a boom in research into the effects of fiscal policy on output and employment. This body of research is growing fast, and much of it is too technical to be summarized in this article. But here are a few highlights. First, Stanford’s Robert Hall has looked at the effects of large changes in US government purchases—which is all about wars, specifically World War II and the Korean War. Figure 2 on this page [see below] compares changes in US military spending with changes in real GDP—both measured as a percentage of the preceding year’s GDP—over the period from 1929 to 1962 (there’s not much action after that). Each dot represents one year; I’ve labeled the points corresponding to the big buildup during World War II and the big demobilization just afterward. Obviously, there were big moves in years when nothing much was happening to military spending, notably the slump from 1929 to 1933 and the recovery from 1933 to 1936. But every year in which there was a big spending increase was also a year of strong growth, and the reduction in military spending after World War II was a year of sharp output decline. Krugman did not explain his chart in detail, so I consulted the study by Robert Hall cited by Krugman. Hall’s insight was to focus not on government spending, just military spending, because other components of government spending are themselves influenced by the state of the economy, making it difficult to disentangle the effects of spending on the economy from the effects of the economy on spending. However, military spending is largely driven, especially in wartime (World War II and Korea), by factors unrelated to how the economy is performing. This makes military spending an appropriate instrument by which to identify and estimate the effect of government spending on the economy. The problem with Krugman’s discussion is that, although using military expenditures allowed him to avoid the identification problem associated with the interdependency of government spending and the level of economic activity, he left out any mention of the behavior of the price level, which, many of us (and perhaps even Krugman himself) believe, powerfully affects the overall level of economic activity. Krugman artfully avoids any discussion of this relationship with the seemingly innocent observation “there were big moves in years when nothing much was happening to military spending, notably the slump from 1929 to 1933 and the recovery from 1933 to 1936.” But even this implicit acknowledgment of the importance of the behavior of the price level overlooks the fact that the huge wartime increase in military spending took place against the backdrop of rapid inflation, so that attributing economic expansion during World War II solely to the increase in government spending does not seem to warranted, because at least some of the increase in output would have been been forthcoming, even without increased military spending, owing to the rise in the price level. It is not hard to compare the effects of inflation and the effects of military spending on economic growth over the time period considered by Krugman. One can simply take annual inflation each year from 1930 to 1962 and plot the yearly rates of inflation and economic growth that Krugman plotted on his figure. Here is my version of Krugman’s chart substituting inflation for the change in military spending as a percentage of GDP. It is difficult visually to compare the diagrams to see which one provides the more informative account of the fluctuations in economic growth over the 33 years in the sample. But it is not hard to identify the key difference between the two diagrams. In Krugman’s diagram, the variation in military spending provides no information about the variation in economic growth during the 1930s. There are is a cluster of points up and down the vertical axis corresponding to big positive and negative fluctuations in GDP with minimal changes in military spending. But large changes in GDP during the 1940s do correspond to changes in the same direction in military spending. Similarly, during the Korean War in the early 1950s, there was a positive correlation between changes in military spending. From the mid-1950s to the early 1960s, annual changes in GDP and in military spending were relatively small. In my diagram plotting annual rates of inflation against annual changes in GDP, the large annual changes in GDP are closely related to positive or negative changes in the price level. In that respect, my diagram provides a more informative representation of the data than does Krugman’s. Even in World War II, the points representing the war years 1942 to 1945 are not far from a trend line drawn through the scatter of points. Where the diagram runs into serious trouble is that two points are way, way off to one side. Those are the years 1946 and 1947. What was going on in those years? GDP was contracting, especially in 1946, and prices were rising rapidly, exactly contrary to the usual presumption that rising prices tend to generate increases in output. What was going on? It all goes back to 1942, when FDR imposed wartime price controls. This was partly a way of preventing suppliers from raising prices to the government, and also a general anti-inflation measure. However, the result was that there were widespread shortages, with rationing of a wide range of goods and services. The officially measured rate of inflation from 1942 to 1945 was therefore clearly understated. In 1946 and 1947, controls were gradually relaxed and finally eliminated, with measured inflation rates actually increasing even though the economy was contracting. Measured inflation in 1946 and 1947 therefore overstated actual inflation by an amount corresponding (more or less) to the cumulative understatement of inflation from 1942 to 1945. 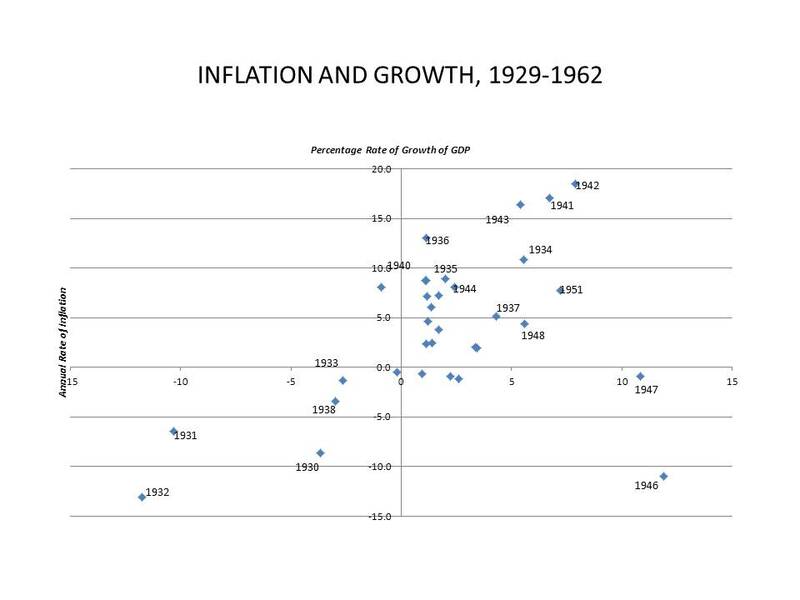 That the dots representing 1946 and 1947 are outliers is not because the hypothesized causal relationship between inflation and GDP was inoperative or reversed, but because of a mistaken measurement of what inflation actually was. To get a better handle on the relative explanatory power of the government-spending and the inflation hypotheses in accounting for fluctuations in GDP than visual inspection of the data allows, one has to work with the underlying data. Unfortunately, when I tried to measure changes in military spending from 1929 to 1962, I could not reproduce the data underlying Krugman’s chart. That was not Krugman’s fault; I don’t doubt that he accurately calculated the relevant data from the appropriate sources. But when I searched for data on military spending since 1929, the only source that I found was this. So that is what I used. I assume that Krugman was using a different source from the one that I used, and he may also have defined his government spending variable in a different way from how I did. At any rate, when I did the calculation, I generated a chart that looked like the one below. It is generally similar to Krugman’s, but obviously not the same. If someone can explain why I did not come up with the same numbers for changes in government spending that Krugman did, I would be very much obliged and will redo my calculations. However, in the meantime, I am going to assume that my numbers are close enough to Krugman’s, so that my results would not be reversed if I used his numbers instead. dGDP = 3.60 + .70dG, r-squared = .295. This equation says that the percent increase in real GDP in any year is 3.6% plus seven-tenths of the percentage increase in government (i.e., military) spending for that year. dGDP = 2.48 + .69dP, r-squared = .199. The equation says that the percent increase in real GDP in any year is 2.48% plus .69 times that year’s rate of inflation. I also tried attributing the inflation measured in 1946 and 1947 to the years 1942 to 1945, giving each of those years an inflation rate of about 9.7% and attributing zero inflation to the years 1946 and 1947. The regression equation that I estimated using that approach did not perform as well, based on a comparison of adjusted r-squares, as the simple equation with a single dummy variable. I also estimated equations using both the government spending variable and the inflation variable, and the two price-control dummies. That specification, despite two extra variables, had an r-squared less than the r-squared of the above equation. [Update 11/20/2012: This was my mistake, because the best results were obtained using only a dummy variable for 1946 and 1947. When the government spending and the inflation variables were estimated with a dummy for 1946-1947, the coefficients on both variables were positive and significant.] So my tentative conclusion is that the best way to summarize the observed data pattern for the fluctuations of real GDP between 1929 and 1962 is with an equation with only an inflation variable and an added dummy variable accounting for the mismeasurement of inflation in 1946 and 1947. Nevertheless, I would caution against reading too much into these results, even on the assumption that the provisional nature of the data that I have used has not introduced any distortions and that there are no other errors in my results. (Anyone who wants to check my results is welcome to email me at uneasymoney@hotmail.com, and I will send you the (Stata) data files that I have used.) Nor do I claim that government spending has no effect on real GDP. 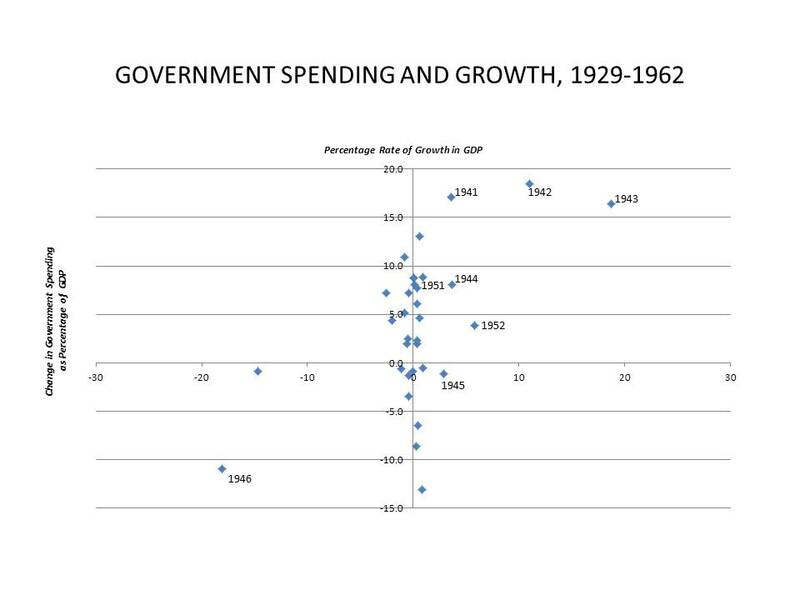 I am simply suggesting that for the time period between 1929 and 1962 in the US, there does not seem to be strong evidence that government spending significantly affected real GDP, once account is taken of the effects of changes in the price level. With only 33 observations, the effect of government spending, though theoretically present, may not be statistically detectable, at least not using a simple linear regression model. One might also argue that wartime increases in government spending contributed to the wartime inflation, so that the effect of government spending is masked by including a price-level variable. Be that as it may, Krugman’s (and Hall’s) argument that government spending was clearly effective in increasing real GDP in World War II and Korea, and would, therefore, be likely to be effective under other circumstances, is not as self-evidently true as Krugman makes it out to be. I don’t say that it is incorrect, but the evidence seems to be, at best, ambiguous. Obviously upset at Tuesday’s election results, Mary Anastasia O’Grady, member of the Wall Street Journal editorial board, takes out her frustration on Ben Bernanke, accusing Mr. Bernanke of buying the election for Mr. Obama. I mean who needs Sheldon Adelson when you’ve got the Chairman of the Federal Reserve Board out there working for you day and night? Which brings us to whom Mr. Obama, if he is going to be honest, ought to thank for his victory. It is the man behind the curtain at the Federal Reserve in Washington. By pulling the monetary levers driving credit—fast and furiously and out of the view of most Americans—Fed Chairman Ben Bernanke artificially juiced asset prices and the housing market just in time for Election Day. If you doubt that, consider this: The total return on the S&P 500 from the beginning of this election year until yesterday was almost 13.9%. The Dow Jones Industrial Average returned almost 9.2%. That means that as millions of Americans have opened their monthly 401 (K) statement this year, they have been under the impression that the losses they suffered after the 2008 financial crisis are being recovered. There has also been a recovery in a number of housing markets around the country. Now lest you think that rising stock prices and a bottoming out of housing prices show that Mr. Bernanke is ably discharging his responsibilities as Fed Chairman, Mrs. O’Grady proceeds to explain why you are being taken for a sucker by a con artist. That cheap credit and the search for yield is driving what is likely to become another bubble may not be appreciated by these investors. Instead, it is not unreasonable to suggest that some significant number, having had their portfolios injected with Mr. Bernanke’s feel-good monetary stimulus, decided that Mr. Obama is in fact making them better off. But are near-zero interest rates and the central bank financing of the U.S. government, through quantitative easing, sustainable policies? To put it another way, can the Fed print our way out of economic and fiscal troubles? If that were possible, Argentina would be a rich country. Instead it is poor and its political system is dominated by leftwing populist demagogues. Mrs. O’Grady has a point. A country cannot permanently increase its output beyond what its available resources are capable of producing. A poor country cannot become rich by inflating its currency. The problem in the US is not that we lack resources, but that we are not utilizing the resources that are available. There are millions of people not working, something that Mrs. O’Grady’s preferred candidate for President spent a fair amount of time repeating for more than a year. The question is not whether monetary policy can create resources that don’t exist, but whether monetary policy can help get idle resources back to work. Perhaps monetary policy can’t do that. After all, there are some smart people who don’t think it can. But we do have a lot of evidence that bad monetary policy does cause high unemployment, as in the Great Depression. And some of us are old enough to remember when, during the Reagan administration, the Wall Street Journal editorial page was continually berating Paul Volcker for holding back a recovery by keeping monetary policy too tight and interest rates too high. The evidence shows that in deep depressions currency devaluation and inflation can work wonders, as FDR proved in 1933. It even worked for Argentina after its financial crisis in 2001. The disastrous policies of the past several years don’t mean that monetary expansion was not instrumental for Argentina’s recovery from the earlier crisis. Mitt Romney is promising to declare China a currency manipulator on “day one” of his new administration. Why? Ostensibly, because Mr. Romney, like so many others, believes that the Chinese are somehow interfering with the foreign-exchange markets and holding the exchange rate of their currency (confusingly called both the yuan and the remnibi) below its “true” value. But the other day, Mary Anastasia O’Grady, a member of the editorial board of the avidly pro-Romeny Wall Street Journal, wrote an op-ed piece (“Ben Bernanke: Currency Manipulator” ) charging that Bernanke is no less a currency manipulator than those nasty Chinese Communists. Why? Well, that was not exactly clear, but it seemed to have something to do with the fact that Mr. Bernanke, seeking to increase the pace of our current anemic recovery, is conducting a policy of monetary expansion to speed the recovery. So, is what Mr. Bernanke is doing (or supposed to be doing) really the same as what the Chinese are doing (or supposed to be doing)? Well, obviously it is not. What the Chinese are accused of doing is manipulating the yuan’s exchange rate by, somehow, intervening in the foreign-exchange market to prevent the yuan from rising to its “equilibrium” value against the dollar. The allegation against Mr. Bernanke is that he is causing the exchange rate of the dollar to fall against other currencies by increasing the quantity of dollars in circulation. But given the number of dollars in circulation, the foreign-exchange market is establishing a price that reflects the “equilibrium” value of dollars against any other currency. Mr. Bernanke is not setting the value of the dollar in foreign-exchange markets, as the Chinese are accused of doing to the dollar/yuan exchange rate. Even if he wanted to control the exchange value of the dollar, it is not directly within Mr. Bernanke’s power to control the value that participants in the foreign-exchange markets attach to the dollar relative to other currencies. But perhaps this is too narrow a view of what Mr. Bernanke is up to. If the Chinese government wants the yuan to have a certain exchange value against the dollar and other currencies, all it has to do is to create (or withdraw) enough yuan to ensure that the value of yuan on the foreign-exchange markets falls (or rises) to its target. In the limit, the Chinese government could peg its exchange rate against the dollar (or against any other currency or any basket of currencies) by offering to buy and sell dollars (or any other currency or any basket of currencies) in unlimited quantities at the pegged rate with the yuan. Does that qualify as currency manipulation? For a very long time, pegged or fixed exchange rates in which countries maintained fixed exchange rates against all other currencies was the rule, not the exception, except that the pegged rate was most often a fixed price for gold or silver rather than a fixed price for a particular currency. No one ever said that simply maintaining a fixed exchange rate between one currency and another or between one currency and a real commodity is a form of currency manipulation. And for some 40 years, since the demise of the Bretton Woods system, the Wall Street Journal editorial page has been tirelessly advocating restoration of a system of fixed exchange rates, or, ideally, restoration of a gold standard. And now the Journal is talking about currency manipulation? So it’s all very confusing. To get a better handle on the question of currency manipulation, I suggest going back to a classic statement of the basic issue by none other than John Maynard Keynes in a book, A Tract on Monetary Reform, that he published in 1923, when the world was trying to figure out how to reconstruct an international system of monetary arrangements to replace the prewar international gold standard, which had been one of the first casualties of the outbreak of World War I. Since . . . the rate of exchange of a country’s currency with the currency of the rest of the world (assuming for the sake of simplicity that there is only one external currency) depends on the relation between the internal price level and the external price level [i.e., the price level of the rest of the world], it follows that the exchange cannot be stable unless both internal and external price levels remain stable. If, therefore, the external price level lies outside our control, we must submit either to our own internal price level or to our exchange rate being pulled about by external influences. If the external price level is unstable, we cannot keep both our own price level and our exchanges stable. And we are compelled to choose. I like to call this proposition – that a country can control either its internal price level or the exchange rate of its currency, but cannot control both — Keynes’s Law, though Keynes did not discover it and was not the first to articulate it (but no one else did so as succinctly and powerfully as he). So, according to Keynes, whether a country pegs its exchange rate or controls its internal price level would not matter if the price level in the rest of the world were stable, because in that case for any internal price level there would be a corresponding exchange rate and for every exchange rate there would be a corresponding internal price level. For a country to reduce its own exchange rate to promote exports would not work, because the low exchange rate would cause its internal prices to rise correspondingly, thereby eliminating any competitive advantage for its products in international trade. This principle, closely related to the idea of purchasing power parity (a concept developed by Gustav Cassel), implies that currency manipulation is not really possible, except for transitory periods, because prices adjust to nullify any temporary competitive advantage associated with a weak, or undervalued, currency. An alternative way of stating the principle is that a country can control its nominal exchange rate, but cannot control its real exchange rate, i.e, the exchange rate adjusted for price-level differences. If exchange rates and price levels tend to adjust to maintain purchasing power parity across currency areas, currency manipulation is an exercise in futility. That, at any rate, is what the theory says. But for any proposition derived from economic theory, it is usually possible to come up with exceptions by altering the assumptions. Now for Keynes’s Law, there are two mechanisms causing prices to rise faster in a country with an undervalued currency than they do elsewhere. First, price arbitrage between internationally traded products tends to equalize prices in all locations after adjusting for exchange rate differentials. If it is cheaper for Americans to buy wheat in Winnipeg than in Wichita at the current exchange rate between the US and Canadian dollars, Americans will buy wheat in Winnipeg rather than Wichita forcing the Wichita price down until buying wheat in Wichita is again economical. But the arbitrage mechanism works rapidly only for internationally traded commodities like wheat. Many commodities, especially factors of production, like land and labor, are not tradable, so that price differentials induced by an undervalued exchange rate cannot be eliminated by direct arbitrage. But there is another mechanism operating to force prices in the country with an undervalued exchange rate to rise faster than elsewhere, which is that the competitive advantage from an undervalued currency induces an inflow of cash from other countries importing those cheap products, the foreign cash influx, having been exchanged for domestic cash, becoming an additional cause of rising domestic prices. The influx of cash won’t stop until purchasing power parity is achieved, and the competitive advantage eliminated. What could prevent this automatic adjustment process from eliminating the competitive advantage created by an undervalued currency? In principle, it would be possible to interrupt the process of international arbitrage tending to equalize the prices of internationally traded products by imposing tariffs or quotas on imports or by imposing exchange controls on the movement of capital across borders. All of those restrictions or taxes on international transactions prevent the price equalization implied by Keynes’s Law and purchasing power parity from actually occurring. But after the steady trend of liberalization since World War II, these restrictions, though plenty remain, are less important than they used to be, and a web of international agreements, codified by the International Trade Organization, makes resorting to them a lot trickier than it used to be. That leaves another, less focused, method by which governments can offer protection from international competition to certain industries or groups. The method is precisely for the government and the monetary authority to do what Keynes’s Law says can’t be done: to choose an exchange rate that undervalues the currency, thereby giving an extra advantage or profit cushion to all producers of tradable products (i.e., export industries and import-competing industries), perhaps spreading the benefits of protection more widely than governments, if their choices were not restricted by international agreements, would wish. However, to prevent the resulting inflow of foreign cash from driving up domestic prices and eliminating any competitive advantage, the monetary authority must sterilize the induced cash inflows by selling assets to mop up the domestic currency just issued in exchange for the foreign cash directed toward domestic exporters. (The classic analysis of such a policy was presented by Max Corden in his paper “Exchange Rate Protection,” reprinted in his Production, Growth, and Trade: Essays in International Economics.) But to borrow a concept from Austrian Business Cycle Theory, this may not be a sustainable long-run policy for a central bank, because maintaining the undervalued exchange rate would require the central bank to keep accumulating foreign-exchange reserves indefinitely, while selling off domestic assets to prevent the domestic money supply from increasing. The central bank might even run out of domestic assets with which to mop up the currency created to absorb the inflow of foreign cash. But in a rapidly expanding economy (like China’s), the demand for currency may be growing so rapidly that the domestic currency created in exchange for the inflow of foreign currency can be absorbed by the public without creating any significant upward pressure on prices necessitating a sell-off of domestic assets to prevent an outbreak of domestic inflation. At any rate, to come back to Mary Anastasia O’Grady’s assertion that Ben Bernanke is guilty of currency manipulation, her accusation, based on the fact that Bernanke is expanding the US money supply, is clearly incompatible with Max Corden’s exchange-rate-protection model. In Corden’s model, undervaluation is achieved by combining a tight monetary policy that sterilizes (by open-market sales!) the inflows induced by an undervalued exchange rate. But, according to Mrs. O’Grady, Bernanke is guilty of currency manipulation, because he is conducting open-market purchases, not open-market sales! So Mrs. O’Grady has got it exactly backwards. But, then, what would you expect from a member of the Wall Street Journal editorial board? PS I have been falling way behind in responding to recent comments. I hope to catch up over the weekend as well as write up something on medium of account vs. medium of exchange. PPS Thanks to my commenters for providing me with a lot of insight into how the Chinese operate their monetary and banking systems. My frequent commenter J.P. Koning has an excellent post and a terrific visual chart on his blog Moneyness showing the behavior over time of the asset and liability sides of the Chinese central bank. Scott Sumner has also added an excellent discussion of his own about what Chinese monetary policy is all about. I am trying to assimilate the various responses and hope to have a further post on the subject in the next day or two.